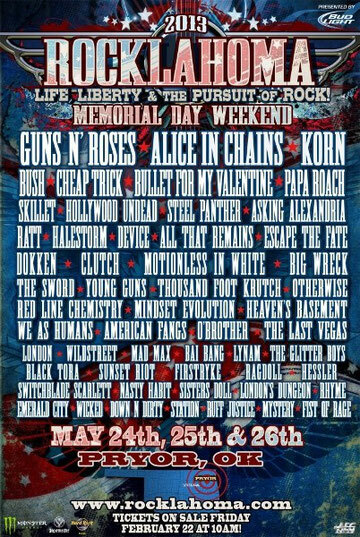 A 3 day rock & camping festival ROCKLAHOMA is held in Pryer, Oklahoma, and merges the hottest rock bands from the 80's, 90's and today for a Memorial Day Weekend on May 24-26th. As you know it started as a festival highlighting all the biggest sounds of the 80's. It will be no doubt becoming a must-see for true rock fans of all ages. Rocklahoma's motto is "Life, Liberty & the Pursuit of Rock." Visit ROCKLAHOMA website for more info.